On June 19th 2013 Marion's brother Tommy joined us in Salta. In May 2011 we had been more than two weeks in this marvelous city, see our article Salta and Quebrada d Humahuaca. This time we visited the outstanding and touching museum Museo de Arqueologia de Alta Montana (MAAM), maybe one of the best in Argentina. It shows the mummies which had been found on the high mountains around Salta including 6739 meters high Llullaillaco. The information how the Incas achieved these altitudes and why they sacrificed kids on the highest summits of the Andes is very good. We traveled to Cachi via the good street RP33 and the Parque Nacional Los Cardones with numberless cactuses and stunning rock formations. Cachi is a nice small town with a pleasant campsite. Few kilometers North of it is the 2500 meters high little village Payogasta with some of the highest wineries on earth. There we found an excellent restaurant with an extraordinary good wine. There are no descriptions about touristic highlights in North of Payogasta in the lonely planet guide of Argentina. But thanks to new outstanding signposting we detected some real good stuff. Opposite of the Puente del Diablo starts the three to fours hike to the twin Volcanos Los Gemelos. We started very early in the morning and enjoyed the full moon on our ascent. The GPS coordinates of the 2949 meters high starting point, which is also a good sleeping place is S24 45.724 W66 10.953. The northern cone reaches 3555 meters sea-level (S24 44.864 W66 09.775), the southern cone 3500 meters (S24 45.271 W66 09.883). After La Poma the road became narrower and steeper. We stayed the next night on a remote spot with a lot of Llamas close to 4000 meters sea-level. We were reluctant to continue in the morning because we saw some ice on the street. But it was sunny and relatively warm. Suddenly an old GM pick-up van came down and we asked the driver about the road conditions. He mentioned that it should be ok besides some ice on the street due to frozen water. Thus we started our journey to the 4895 meters high pass Abra del Acay. We removed some ice with our mountain ice-axes. We shoveled some gravel and dirt on the remaining ice. But a section with more than 25 meters of thick ice came. We worked desperately more than two hours. The GM can came back, now with kids and women. Fortunately the driver had a much better equipment than our tiny ice-axes. Finally he dared to cross the ice with his car and we followed with a weird feeling in our stomachs. After a snowy section and some narrow hairpins we were more than happy to achieve the col Abra del Acay. Our intention was to stay the night there and to climb up to the summit of Nevado de Acay on the next day. But there was gale with more than 100 kilometers per hours. Opening the door of the car was nearly impossible. In addition we were really exhausted from the endless ice hacking. Driving down on the sunny northern side to San Antonio de los Cobres was smooth. 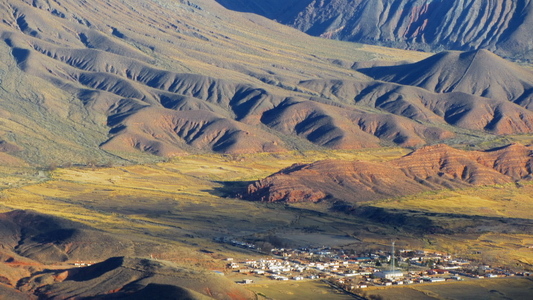 It is a cold and dusty town with more than 3000 inhabitants at 3770 meters sea-level. We stayed the night under the railway viaduct La Polvorilla. On the way back to the town we found the hot springs Banos de Pompeya. Unfortunately they were in miserable even dirty condition and we could not enjoy its hot water. North of San Antonio de los Cobres we passed the huge salt lake Salinas Grandes. Our intention was to drive to San Pedro de Atacama in Chile via the fully paved road over the col Paso de Jama, which we know very well. We crossed it without any problems two ears ago, see article Salta and Quebrada de Humahuaca. But we were stopped in the last bigger village Susques because the pass was closed. Many trucks were stuck in ice and snow for several days already. And the weather forecast was snow again. Consequently we turned and drove down into the marvelous Quebrada de Humahuaca. On June 29th 2013 we said bye bye to Argentina and crossed the border to Bolivia. Que hermosas fotos Feliz cumpleaños Alfred ! esto si que es festejar y celebrar la vida , rodeado de maravillas comenzando por Marin y siguiendo con toda la naturtaleza que los rodea y los sorprende a cada instante. I moved from florianopolis to campo grande - ms. Let me know when you are in the near.